This is an overview page for those who cannot view websites with frames. The clean, modern simplicity of roman blinds has made them extremely popular in today's interior home, offering a stylish and economical alternative to curtains. Our roman blinds are made up using high quality components and are supplied fully-strung attached to a wooden baton by means of Velcro, therefore, making them easy to remove and clean. All blinds are hand-finished down side and bottom hems to produce a professional finish and are lined with white or cream lining (blackout lining is also available) with narrow fibre glass rods sewn into the lining to ensure when the blinds are raised, horizontal pleats are kept regular and straight. 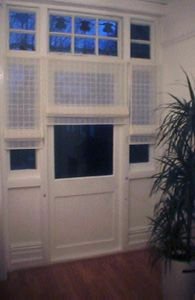 If required, blinds can be supplied unlined with the rods sewn into the main fabric. If the blind width exceeds that of the fabric width then two pieces of fabric are joined either side of a central piece of fabric. Blinds are fitted either outside the window recess or inside the window recess with left or right cord pull. These blinds are perfect for any window especially a series of windows or bay. The blind is controlled with a simple cord and cleat mechanism with chunky glass rings attached to the top allowing the cord to glide smoothly. The blind is attached to a wooden batten with touch and close tape. These blinds are made so when dropped to full window length - a "rolled up" effect is still shown at the bottom - of course they can be totally flat if this is desired. All our fabrics can be used except muslin - woven stirpes are especially good as they have a 'reverse' effect. These blinds are not lined and cannot have fabric widths joined together. Linens - A luxurious natural fabric with an incomparable feel and look. Linens/Cotton Unions - These fabrics are a mixture of linen and cotton which are just as lovely, but a little more economical. Cotton - This range offers different textural finishes and a selection of woven stripes. Sheers - Sheers let in an abundance of light whilst still allowing privacy. • measure the width from a to b and add 10cm to allow for the blind to give sufficient overlap each side of the window. • measure the length from c to d from where the blind is to start, usually 10cm above the window, and where the blind is to finish, usually, 5cm below the window. Make sure there are no obstructions eg window levers which would affect the smooth operation of the blind. • measure the width from a to b and subtract 2cm for clearance. • measure the length from c to d.
• As a precaution take three measurements for the width and length left, right and centre and record the smallest measurement. These measurements are a suggested guide only - please feel free to adjust accordingly..
All prices include cotton sateen lining and all components. Prices include all components (Roll-up blinds are not lined). Note:If you do not require lining please deduct 20%. Extras - Blackout lining - For widths up to 122cm add £5, over 122cm add £10. 1. Get a Price - Please go the Prices page and see which price range your blind measurements fall within. 2. Choose your fabric - Please E-Mail your details to us to receive a free Fabric Sample pack to see the fabrics close up. As our fabrics are creams/naturals it is difficult to achieve a true likeness of colour on a computer. Order Form which you will find inside the Fabric Sample pack. 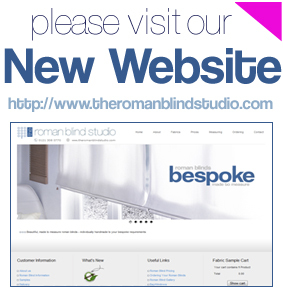 The Roman Blind Studio, 14 Harman Road, Sutton Coldfield, West Midlands B72 1AH United Kingdom. (At the moment we can only accept cheques as payment) On receipt of your order we will E-mail confirmation to you. How to pay As all goods are made to measure, full payment is required with the completed order form. Cheques for blinds and curtains should be made payable to the 'The Roman Blind Studio'. Upon receipt, order confirmation will be forwarded to you. Delivery Please allow 21-28 days for goods. We will inform you when the curtains/blinds are finished to arrange a suitable delivery date. A signature will be required upon delivery. Returns Unfortunately, we are unable to offer refunds on custom made goods. We want you to be completely delighted with your blinds/curtains - so please be careful when measuring. Please refer to the web sites for detailed information. Fabric Care We recommend dry clean only on all of our fabrics. Trade Description Every care has been taken to ensure descriptions are accurate. Whilst every effort has been made to reproduce colours of fabrics on the computer, these obviously may not be 100% accurate, so please send for our free fabric sample pack which show these more accurately.